E lephants, tigers, pigs, giraffes, kittens, dogs and chickens play with the bees and butterflies in this delightful Noah's Garden Sampler. Stitched using silk flosses, overdyed silks on soft Summer Khaki Cashel linen, this playful garden sampler is a colourful addition to the Victorian Garden series. In the distance, at the top of the sampler, you first see the flower bedecked Ark on the sea at the shore, with two tigers just emerging from the hold, as they head down to the garden. The elephants trumpet a welcome, and the pigs wallow happily in the mud rooting for forgotten vegetables. The land is drying, and the rainbow stretches over the garden, the peace dove flying overhead with a olive branch in it's beak. Chickens, dogs, cats and other animals enjoy the flowers and vegetables which Mr and Mrs Noah have planted, since their arrival. Below, you see the happy couple in their gardening clothes, harvesting the apples, and grapes from the orchard. This Learning Sampler is perfect for the beginning through intermediate specialty stitcher. You will practice a Pulled Thread Band, Bargello, Colonial Knots, Rhodes, Herringbone, Queen, and other stitches. Take some time to walk through Noah's Garden and enjoy the promise of the Rainbow yourself! One Hand painted Gold-plated Dove Charm to compliment the Noah's Garden colours. Also available our separately packaged Victoria Sampler Gold Plated Hand painted Peace Dove Charms! They are specially painted by our own artist to compliment "Noah's Garden" sampler! 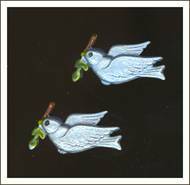 Each Dove charm can vary slightly according to the whim of our artist. Use them to decorate the sampler, the charming little pincushion, or the bell pull hardware like we did! But don't just use them for Noah's Garden Sampler! They are really cute to use in all sorts of places. 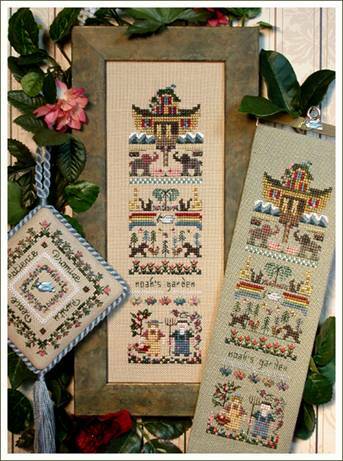 Attach them to other items to liven up a garden scene, needleroll or hardanger ornament! Glue them to your mat when framing. Use your imagination, and have fun!